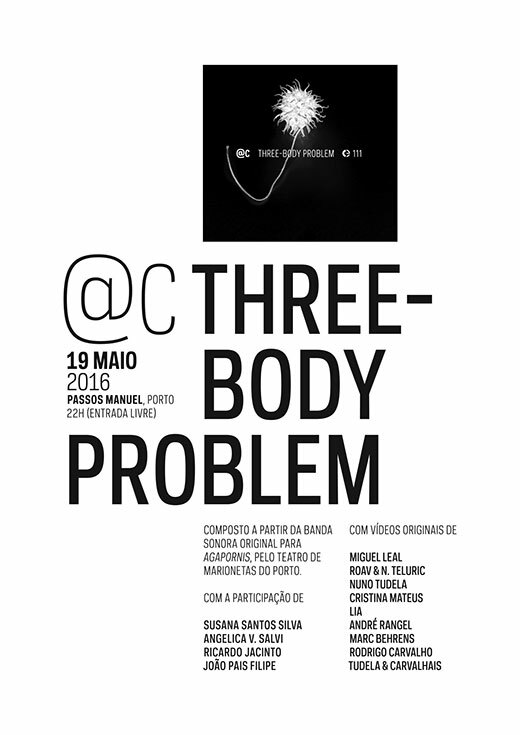 Pedro Tudela and Miguel Carvalhais will present their new album, “Three-Body Problem”, with a session of videos featuring new works from Miguel Leal, Roav & N. Teluric, Nuno Tudela, Cristina Mateus, Lia, André Rangel, Marc Behrens, Rodrigo Carvalho, and Tudela & Carvalhais. This entry was posted in Artists, Live, News, Releases and tagged @c, André Rangel, Angelica Vazquez Salvi, Cristina Mateus, João Pais Filipe, Lia, Marc Behrens, Miguel Carvalhais, Miguel Leal, Nardran Teluric, Nuno Tudela, Pedro Tudela, Ricardo Jacinto, Roav, Rodrigo Carvalho, Susana Santos Silva. Bookmark the permalink. Comments are closed, but you can leave a trackback: Trackback URL.